The next aspect to consider is Flavour. Flavour is how strongly the theme is represented within the game. Typically, flavour comes from nice artwork on the board and playing pieces. 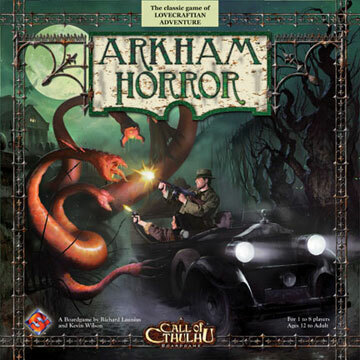 Good examples of flavourful Cthulhu games are Eldritch Horror, Mansions of Madness and Arkham Horror. These have beautiful boards and artwork, the text on the cards is well-written and evocative and there are little figures. The story that these games tell are proper Cthulhu stories, i.e. saving the world, mansion or city from the GOO. In contrast, there is a Cthulhu game out there which is basically a variation of checkers with some tentacles printed on the board. This is an example of poor flavour. The last aspect is Mechanics. The Mechanics of a game are the particular details of what you do when playing a game. Are there cards? Do you roll dice? Do you move figures around a board? Is the game competitive or cooperative? Even a gorgeous game can be dull to play if the mechanics aren’t interesting. If all you do is roll a die and move around a board, then this can get tiresome after a while. However if in the play of the game, move by move, card by card, these details actually manage to ‘feel’ like the theme then you have a excellent game. For example, in the awesome Arkham Horror, the players are investigators running around the 1920’s city of Arkham, killing monsters and closing inter-dimensional portals before the Great Old One awakes and devours the city. The mechanics come in when you turn over a card and have a little adventure, rolling dice to see if you succeed or fail. Succeed and you get something useful, fail and you get a little more insane or miss a turn or lose some money. Similarly, before you can fight a monster you must see if you first go mad from even looking at it. All these details of the game fit with the theme and make a great experience. The variety in the cards and different activities you can attempt (shopping for magical items, learning spells, fighting monsters in the streets, travelling to other dimensions) mean each game plays out differently with each player getting to tell his or her own story. Before you can enter Moria, you must get past the East Gate, which is harder than it looks. 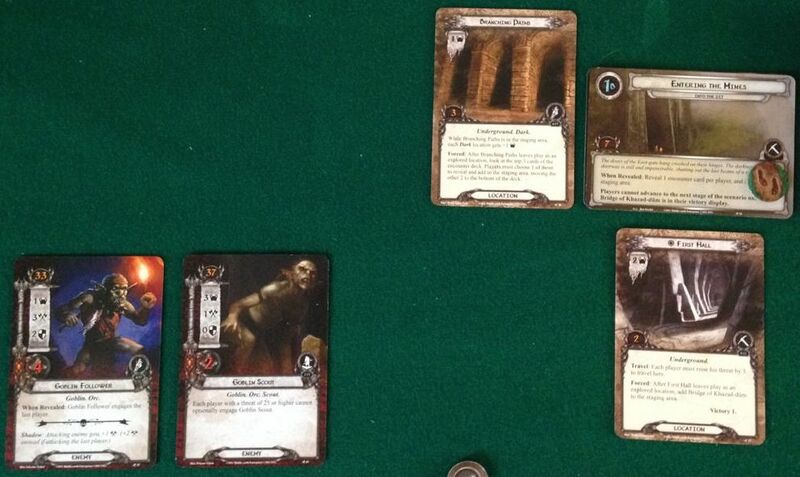 Switching to another franchise, the Lord of the Rings Card Game has great mechanics that add loads to the flavour. The cards already have gorgeous painted art showing characters and locations of Middle-earth, but in each adventure pack the rules on the cards can combine to create some very clever situations. This exploring is done in the ‘quest’ phase of each turn. Questing is pretty simple. All the characters who are on the quest add up their willpower points and compare this total to the threat (difficulty) points of all the enemies and locations waiting to be encountered. If their willpower is higher then they add progress counters to the quest. If it is lower then the threat counter goes up and more enemies will eventually attack. Technically it is just a fairly straight-forward bit of arithmetic and bean-counting, so how can it be flavourful? It is in the details on the cards. 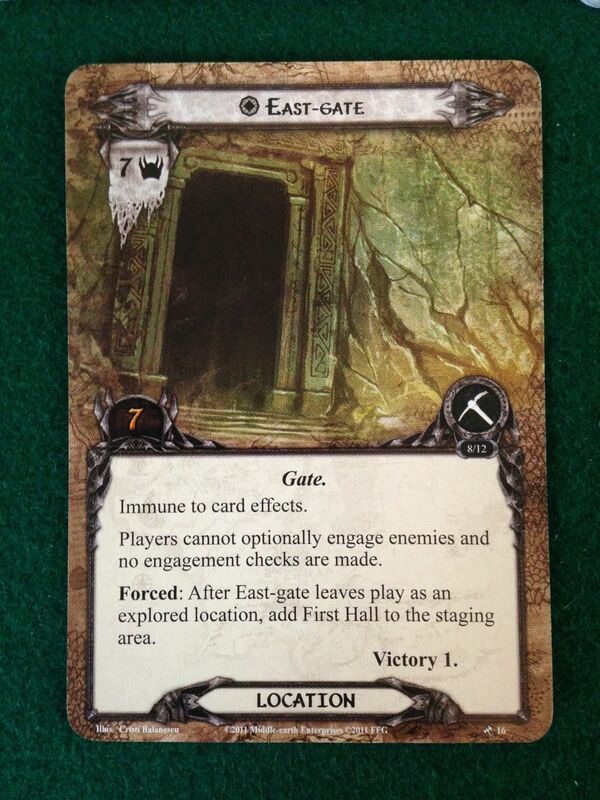 The card for the East Gate has a special effect saying that until you have explored it, enemies do not attack and the players cannot attack enemies. Woohoo, you think. We are safe from attack! That has to be good, right? With the unexplored location Branching Paths and two goblins lurking around (a total of 5 threat), I need 6 willpower to even start making progress getting past the East Gate. All the while more goblins gather. Not so much. In practice, this means that the enemies stick around each turn and keep adding their threat and make it harder to explore the locations. You need a lot of questing characters to add up enough willpower points to beat the increasing total of all the enemies. Usually you want to quickly fight and kill enemies to get them out of the way, but here you can’t. They just lurk in the shadows while you slowly edge through the passageways. When you finally manage to explore the East Gate, you then put the First Hall into play and this has a threat cost to travel to it. This all pushes your threat counter up and up and means that when the East Gate is explored and enemies are allowed to attack, your threat score is so high that every lurking enemy will suddenly attack at once! I finally explore the East Gate and travel to the First Hall, and the waiting goblins immediately attack! Yikes! Watching goblins and orcs gathering and waiting to pounce while you try and find your way from the East Gate to the First Hall is very tense and feels like the Moria chapters in the books, and it all comes from the mechanics of the game. Different adventure packs have different rules on the cards, creating very different feels for each adventure. In one scenario you are chasing Gollum along the river, in another you have to find the healing plant Athelas to help a wounded eagle before time runs out, in another you are being put in sacks by trolls. One last thing, I don’t want to give the impression that mechanics are necessarily subservient to theme and flavour. Chess is the best game in the world and has almost no theme nor flavour, but it has simple and elegant mechanics and these are plenty good enough.